NEW! 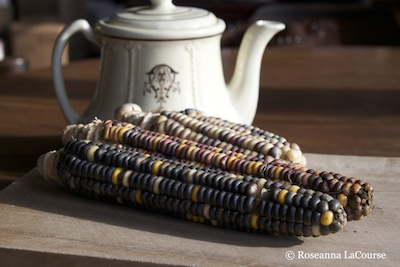 (80 days) An eight-row flint corn from the Iroquois and Seneca seed keeper Darwin John. Extremely early. Seven-foot plants with two ears each. 5" ears, large kernels. Organic. Flint corn has colorful kernels with hard outer shells; it is used primarily to make cornmeal, which was a staple of all farm diets in the 1800s. Approximately 100 seeds per oz. Sow at 2 oz. per 50 feet of row, 1# per 400 feet of row, or 10-15#/acre.